One Liner Review: a surprisingly very funny movie with a talented cast that knows exactly which buttons to push to crank up the humor. 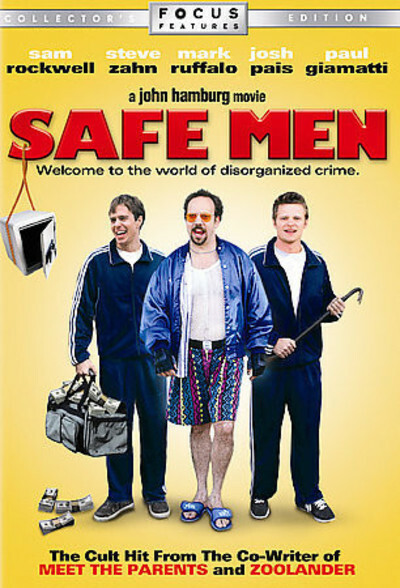 Safe Men is a movie that has no business being as funny as it actually is. for one thing, the movie seems to be clearly made on the tiniest of budgets. and for another, it feels a lot older than it actually is. the movie is from 1998, yet it could easily have been made in 1988. it was written and directed by john hamburg, and that’s a first indication of why it worked out so well, right there. hamburg is not a genius, but he is very good at delving out some funny ideas. he doesn’t have a whole bunch of movies under his belt, but the ones he does have are all based on some pretty humorous concepts. as a writer / director, he has made this movie, then along came polly, and then i love you man. along came polly is the best of the bunch with ben stiller going all out to bring this story of a nervous guy trying to date a hottie to the screen. as a writer, hamburg penned all three meet the parents movies. now, only the first of those films was very funny, but he did come up with the concept for the whole thing. and you have to know that the sequels were based on a studio demanding more and throwing a paycheck in his face. i love you man, like the meet the parents films, isn’t great, but it is certainly based on a funny premise. as these two guys are dealing with their issues regarding the profession they have chosen, there are two other guys who are safe robbers pulling jobs. one of them, frank, is played by mark ruffalo. and one day these two robbers decide to skip going to their usual bar after doing a job, and our two music guys end up there at the same bar, drinking the same drinks. that’s when gangster veal chop, played by paul giamatti, mistakes them for the safe robbers and tricks them into doing a job for him. veal chop works for a big boss called big fat bernie gale. he’s played by michael lerner, the great actor who commanded his movie producer role in barton fink. here, he’s a lot of fun, making fun of himself and the outfits that he wears. he’s a jewish gangster and his son is about to be bar mitzvah’d , and there’s a lot of humor surrounding that whole thing. like how veal chop sits down and talks with the son about getting the sound of the prayers right. meanwhile, big fat bernie gale and veal chop tell the two musicians that they have to crack three safes or else they’re going to be killed. the musicians know that if they tell these gangsters that they are not the guys the gangsters think they are, they’ll wind up dead. so they pose as the safe crackers and set out to do the jobs. that’s where things start to get really funny. of course, these guys are not safe crackers at all, and so they can’t pull off the jobs. they go to the locations and they try each safe, but they don’t have a clue what they are doing. the first safe belongs to another gangster, played by harvey fierstein. he’s actually a fence, and we get to see exactly what that means when sam goes to his store, walks through the back room of a barbershop, and sees all of the stolen merchandise for sale. when sam and eddie break into fierstein’s house, they are caught by his daughter, hannah, who happens to be the girl who just ended a relationship with mark ruffalo. the banter between hannah and sam is very funny. sam pretends like it is no big deal what he is doing and acts very casual even though he was just caught in hannah’s house. he even asks hannah if she can just give him the combination to the safe. the hannah character ends up leading to some of the funniest moments in the movie. like the flammable pants story that her father tells. while most of this movie works, there are a good amount of gags that also don’t. for example, i’m not a fan of watching grown men cry and thinking that it’s funny. and that happens a couple of times here, first with rockwell crying and then with ruffalo. still, the actors are great here and all have some real screen presence. even the bar mitzvah at the end, with the ridiculous host, is kind of funny. it’s a good movie and definitely enjoyable.